President Donald Ramotar said Caricom needs more dynamism. 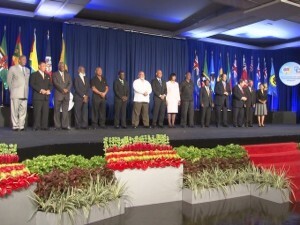 Addressing the re-enacting of the treaty signing at Chaguaramas, the Guyanese President said the Region has no doubt made great progress, but the time has come to move the process forward “with more vigor and more purposefully”. For Ramotar, the most important achievement is for the people to see and feel the benefits of Caricom. He told his colleagues, who have often been accused of talking too much and no action, that there is no need to reinvent the wheel, as there are enough research papers and reports pointing the way forward. He said that words need to be put into action and according to him, failure to act, could lead to them being accused of a commitment deficit. Also addressing the signing this morning, the Prime Ministers of Barbados, Trinidad and Tobago and Jamaica, who spoke of the many achievements and challenges in Caricom. And the common statement is that Caricom is not an event but a process. The leaders also called for a constant evaluation and renewal of this process.